Good news for body-conscious cruise fans: HYPOXI is expanding its cooperation with TUI Cruises and will on board the new “Mein Schiff 4” to help passengers keep in form. On 5 June 2015 the newest member of the “feel-good” fleet will be christened and then set sail on its maiden voyage. Thanks to HYPOXI, bikini figures can be ensured for sunbathing on the sun deck. Guests can make use of the HYPOXI-Training and benefit from the support of specially trained HYPOXI-Coaches in the generous SPA & Sport area. 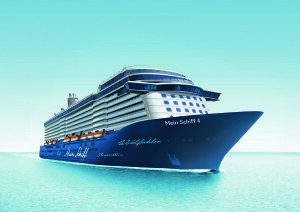 The “well-being” concept of TUI Cruises and the innovative figure forming methods had already worked well together on the ship “Mein Schiff 3”. The HYPOXI-Method helps to reduce size and tighten skin in the usual problems areas (stomach, legs and bottom), without strenuous fitness workouts, sore muscles or radical diets. The training consists of moderate movement together with high and low pressure treatment. This combination stimulates the metabolism and circulation in the problem zones and thus helps to reduce fat in precisely those areas. One training unit, which can be completed up to five times a week, lasts 30 minutes – which means there is plenty of time left over for enjoying the huge range of entertainment offers on board. Even better: there’s no need to have a guilty conscience when thinking about the eleven restaurants and bistros on board, where top chefs pamper the guests with their amazing culinary skills. Those who want to reduce fat in the problem zones using HYPOXI must ensure they eat a balanced and healthy diet, and the varied, high quality range of food available on the Mein Schiff fleet makes it easy to put together an appropriate meal. Of course, the HYPOXI personal coaches are available to provide advice when needed.